As the Colorado River meanders through the canyons of Dead Horse Point State Park and Canyonlands National Park, it cuts a deep path into the surrounding sandstone. 2,000 feet at the bottom of the canyon below, the Colorado River makes a meandering gooseneck turn as it enters Canyonlands National Park. Stunning views and spectacular sunsets adorn the landscape surrounding Dead Horse Point, which rival the finest views the Desert Southwest has to offer. 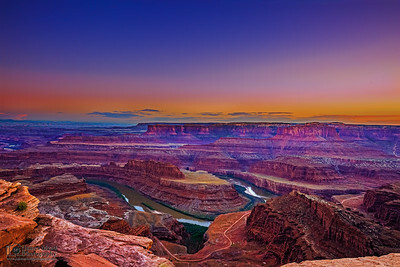 The sun sets over the Colorado River, Dead Horse Point and Canyonlands National Park (the far side of the Gooseneck Meander and beyond) as backscattering begins to transition the yellow and orange to pink as the sun sets. The last light of day begins to fade over Dead Horse Point, the Colorado River and Canyonlands National Park (the far side of the gooseneck bend) as twilight sets in and dusk nears. The Colorado River make a meandering gooseneck turn in the canyons of Dead Horse Point State Park 2,000 feet below as backscattering illuminates the skies above with brilliant pinks and oranges at sunset. Canyonlands National Park is located on the far side of the Gooseneck Bend. As the sun sets, backscattering casts a pink glow in the skies over the Colorado River, Dead Horse Point State Park and Canyonlands National Park.